This March, the Institute of Buddhist Studies hosted an international confernece titled “Buddhism without Borders: contemporary developments in Buddhism outside Asia.” The conference brought together more than two-dozen scholars to present new and innovative research, and nearly seventy participants from four continents were in attendance. The conference was divided into six panels focusing on such topics as Buddhist Expressions and Experiences, Transnational Buddhims, and Buddhist Identity. Each panel had four panelists and a moderator and included time for discussion with the audience. 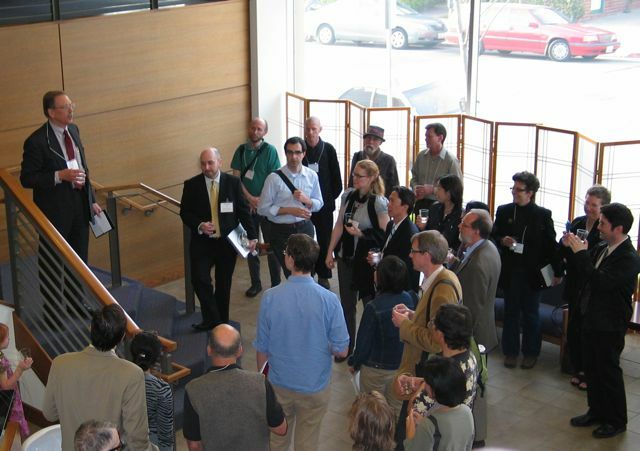 The event’s keynote address was delieved by Prof. Thomas A. Tweed of the University of Texas at Austin on Friday, March 19th. Prof. Tweed’s address focused on his recently published Crossing and Dwelling: A Theory of Religion, and it’s implications for the study of Buddhism. He described religions as social processes that confront suffering and intensify joy, and he challenged scholars to follow the global and trnasnational flows of communication that are a major factor in how religions spread in the modern world. For Buddhists, his theory, with its emphasis on the constantly changing and interdependent nature of religion, is readily applicable, and he discussed the many ways that Buddhism is influencing American culture more broadly. Panelists included some notable names in the field of American Buddhist Studies such as Charles S. Prebish, Franz Aubrey Metcalf, and Richard Hughes Seager. The Institute’s Dean, Richard K. Payne presented a paper as well as a number of younger scholars who represent the next generation of American Buddhist Studies such as Jeff Wilson and Wakoh Shannon Hickey. With twenty-four scholars in attendance, a wide diversity of Buddhist traditions and research was presented. Charles Prebish, the Redd Chair in Religious Studies at Utah State University, presented his preliminary findings of Buddhists in Utah and their experiences living in a dominate Mormon culture. Jeff Wilson of the University of Waterloo discussed the regional specificity of Buddhism in North America, noting the uniqueness of Buddhists living in different parts of the country. Duncan Ryuken Williams of the University of California, Berkeley, delivered a moving account of young Japanese-American Buddhists fighting for the U.S. armed forces during World War Two. Other panelists discussed Buddhist developments in other parts of the Western world. Jitka CirklovÃ¡ and Ruth Fitzpatrick reported on Buddhism in the Czech Republic and Australia respectively. And the work of Richard Seager, Daniel Veidlinger, Kimberly Beek, and Mindy McAdams demonstrated how Buddhism is being expressed through the arts, online, and in popular literature. Tibetan, Theravada, Zen, Shinshu, and Shingon, were among the many schools of Buddhism under discussion, discussed through papers on topics as diverse as modernism and transnationalism, hospice workers, Jewish-Buddhist mindfulness practices, and politics. The organizers hope to collect many of the event’s papers for future publication. Seventy participants registered for the event. While most participants came from the United States, others traveled from Canada, Europe, Australia and Japan. Prof. Tweed’s keynote was open to the public, and the Kodo was filled to near capacity. Several participants were able to utilize the Jodo Shinshu Center’s hotel and dorm rooms. And many in attendance expressed their gratitude to the building’s staff who were, as always, welcoming and helpful. The Institute would like to extend its sincere thanks to its students and the staff of the Jodo Shinshu Center for their help and hospitality in creating such a successful conference.